Sounds simple enough, but it is very very important to set up a good system and then go through it each time. On some studies, a major finding may jump out at you and distract from other areas, which may contain even more significant findings. This phenomenon has been termed search satisfaction, which is where you note a finding and therefore stop searching for more. One way to avoid this is to try to make at least two findings on every study, no matter how trivial, just to force yourself to cover the entire study. Hopefully you are not satisfied with this post... yet. Getting back to head CTs, there are some unique features of the brain that assist in one's reading of this type of study. The main feature is symmetry: the two hemispheres of the cerebrum and cerebellum should generally look the same. Unlike the abdomen or even the chest, symmetry in the head allows for easy comparison across the midline whenever a possible abnormality is questioned. Another helpful feature is that the cranium is a confined space, so if there are masses (or abnormalities with mass effect), neighboring structures will typically be compressed rather than merely pushed out of the way. Practically this means that even small lesions can have a significant impact on the appearance of the brain. 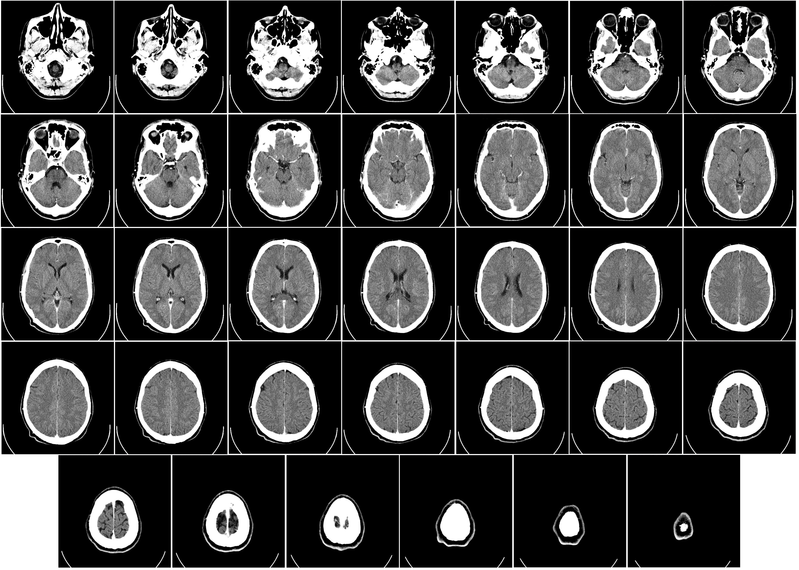 Keeping those general principles in mind, here is one general 10 step approach to assessing a head CT. Check to see if the cerebellum is symmetric. If the cerebellar fissures are prominent, this may represent volume loss. If the tonsils are low-lying (visible below the foramen magnum), this may represent a normal variation or an Arnold-Chiari malformation. Ensure that the four ventricles are in their expected positions and are not enlarged. The lateral ventricles should be symmetric. The midline structures should be... midline. Specifically, the septum pellucidum should be exactly in between the lateral ventricles. To check deviation, draw a line from the apex of the inner table of the calvarium anterior to posterior. At the level of the globus pallidus, check for deviation of the septum from the line. Look for any collections between the inner table of the calvarium and the brain parenchyma. Blood, CSF fluid, air, and pus can potentially collect here. For bleeds, biconvex collections represent epidural bleeds; lenticular bleeds represent subdural bleeds and can cross suture lines. Subarachnoid bleeds will line the sulci. The base of the skull is a good place to look for bleeds after trauma due to the sharp edges there. Check for symmetry, gray-white differentiation, areas of hyper- or hypo-attenuation, and any architectural distortion. Check for symmetry, propotosis, lens position and thickness, the optic nerve, artery, and vein. Use soft tissue windows. Make sure no masses are seen behind the globe. This is also a good time to check the lamina papyracea to rule out any fractures. Look for mucosal thickening or polyp formation. In trauma, fluid and blood can collect in the sinuses. Check to make sure that fluid is not accumulating in the air cells, especially in the setting of trauma. Fractures can be hard to spot in the skull. The key to identifying an acute fracture is to look for overlying soft tissue swelling, lack of sclerotic margins, and lack of symmetry. Vascular channels are plentiful in the skull and easily confused for a fracture. However, they will have sclerotic margins. Sutures should be symmetric. Look for soft tissue swelling or masses. Outside of the setting of trauma, the soft tissues should generally be unremarkable. While this is not a fully comprehensive approach to reading a head CT, it provides a framework for assessing the critical structures. By being systematic and thorough each time, it is highly unlikely that you will miss a significant finding. Review your neuroanatomy thoroughly to help you localize a lesion once you do spot an abnormality. For pediatric patients, the head CT may be preceded by a neonatal head ultrasound, which we will cover in a future post. Renal masses are fairly common in the pediatric age group. Two of the most common are neuroblastoma and Wilms Tumor. Neuroblastoma is a neuroendocrine tumor that usually develops in the adrenal glands, but can develop in any neuroectodermal tissue. One unique feature of disease is that a subset of children with metastatic disease located only in the liver, bone marrow, and skin, will demonstrate spontaneous regression. This Stage IV-S (S for special) does not require any form of chemotherapy. Wilms tumor (also called nephroblastoma) is the most common renal malignancy in children. It develops from the embryologic metanephric blastema. The eponym was coined for German surgeon Max Wilms who first described the entity. 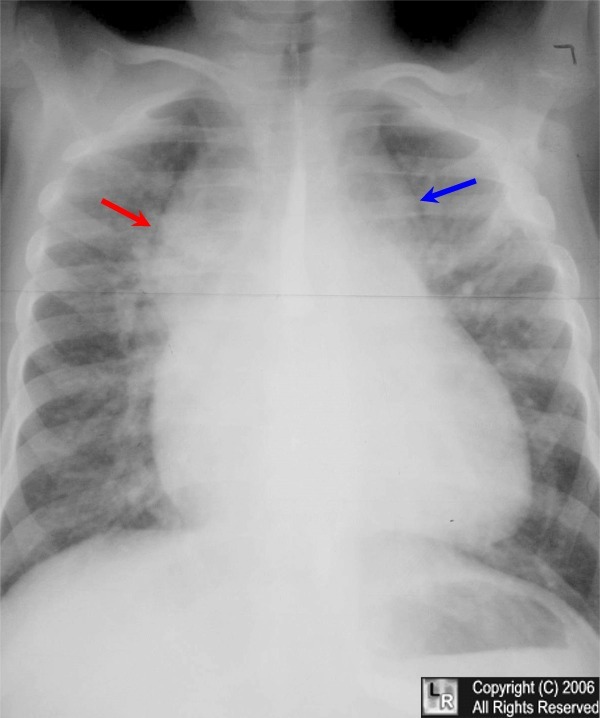 Adapted from Pediatric Imaging: The Fundamentals, 1e by Lane Donnelly. To summarize, Wilms tumor occurs in slightly older children, is centered in the kidney, and has vascular spread. Neuroblastoma is typically younger and more agressive, metastasizing by direct spread to liver and bone. The most common location of Wormian bones is the lambdoidal suture. The most common cause is actually idiopathic. T Tetralogy of Fallot 4 findings: Pulmonary stenosis, RVH, VSD, aortic override; "boot shaped heart"
In TAPVR, the pulmonary veins do not drain into the left atrium. In the most common form Type I, the vessels form the left vertical vein and drain superior to the heart to the brachiocephalic, SVC or azygos vein. The left vertical vein forms the snowman's head. In Type II, the pulmonary veins drain to the coronary sinus. In Type III, they drain subdiaphragmatically to the IVC. 2 years old at presentation. The mnemonic comes from Donald R. Kirks, MD as described in Lane Donnelly's Pediatric Imaging: The Fundamentals . In general, keep in mind that the upper lung zones have increased aeration and decreased perfusion relative to the lower lung zones due to the effects of gravity. For whatever reason, I have a difficult time wrapping my head around the Lauge-Hansen (LH) ankle fracture classification. The Weber classification is a little more straightforward, but doesn't impart as much information about the injury as the LH classification. I'm going to go through ankle fractures like I did with pelvic fractures and hopefully, in attempting to understand the LH classification, impart some knowledge on everyone else. As usual, I'm stealing my images from the AAOS Comprehensive Orthopaedic Review. Information is borrowed from this text and the Handbook of Fractures. To begin, let's take a quick look at the anatomy of the ankle joint (picture below). The ankle is made up of articulations between the tibia, fibula and talus. The joint is maintained by a variety of ligaments. On the lateral side, the anterior inferior tibiofibular ligament, posterior inferior tibiofibular ligament and the inferior transverse ligament help to prevent eversion of the ankle. The lateral collateral ligaments of the ankle (anterior/posterior tibilfibular ligaments, calcaneofibular ligaments) help to prevent inversion and anterior translation of the fibula. Medially, the strong deltoid ligament, which has a short and thick deep layer covered by a more superficial layer help to resist inversion of the foot. To see the rest of the post which attempts to clarify the situation a bit, including the anatomy and fracture diagrams, check out the post on the blog Bone Broke? Me Fix! The challenge for the radiologist is a little different from the orthopedist, who is more concerned about treatment. From the plain x-ray, the radiologist has to infer which type of injury has occurred. The following framework applies to the most common categories but is not all inclusive. Remember: in an ankle fracture x-ray, is the fibula fractured? Yes: Is the fracture above the tib-fib syndesmosis, or at/below it? High: If there is only a medial malleolus fracture, this is a pronation-external rotation type III; if there is a medial and posterior malleolus fracture, this is a P-ER type IV. At/Below: If there is a posterior malleolus fracture also, this is a supination-external rotation type III; if there is only a medial malleolus fracture also, this is a S-ER type IV. No: Is there a medial malleolus fracture? Yes: This is a P-ER type II or III fracture. Like anything, getting used to this classification scheme takes practice. Review ankle fracture studies several times until it becomes comfortable. To help narrow your differential diagnosis, consider the thickness of the cavity's wall. If the thickness is greater than 10 mm, this favors a metastatic process; thinner walls are more likely to be secondary to the other causes, with infection being the most common. (C) Minava Blogs, 2008-2012. Awesome Inc. theme. Powered by Blogger.